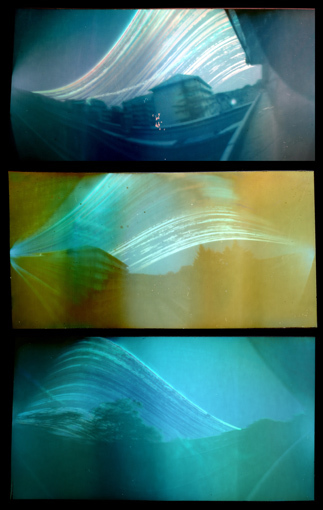 SolargraphyGallery - April 2010: Pinhole Day coming up! Home The Project What's Up 2010 -12 April 2010: Pinhole Day coming up! The last Sunday in April will be the Pinhole Day of the world. So it is possible to take part in it by sending one pinhole image exposed in that day to the Pinhole Day Gallery. But in solargraphy the direction of the Sun is important for catching the sun path. "This is a series of solargraphies, made from the same place (Ancien college des Jésuites, REIMS, FRANCE) between summer solstice 2009 and winter solstice 2009. Top picture is the eastern view, middle picture is the southern view, and bottom picture is the western view."